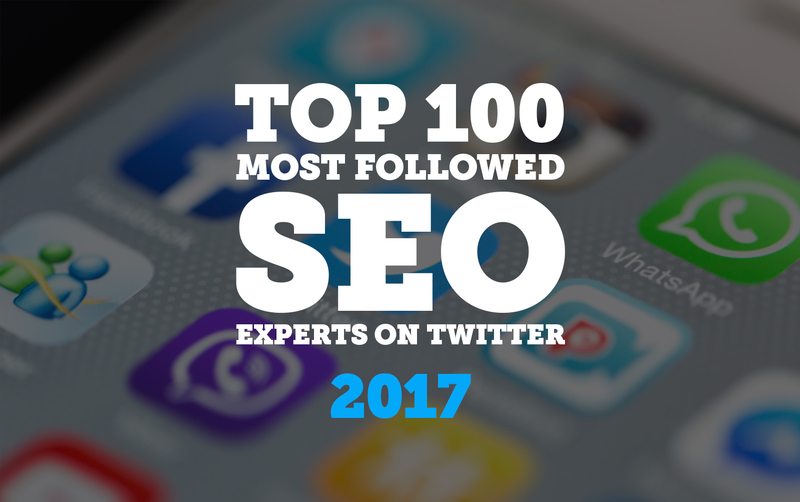 Last year, our CEO Josh Steimle created the post Top 100 Most Followed SEO Experts on Twitter for 2016. It’s time for a 2017 update! Also, I found it extremely helpful to follow another article Josh wrote explaining, in detail, the full process. Before we see the list, I want to mention the parameters used to decide who made the list both years, and a few disclaimers to better help us interpret the list. Most followers ≠ most qualified SEO expert. Some of the best SEO experts may not even be on Twitter, let alone have a lot of followers. I don’t know how these folks got their followers. There were a few cases I was 99% sure weren’t legit, so I removed them. The rest are for you to judge. I believe I was pretty thorough in building my list, but there may be some key people I missed. Let me know who they are so I can make sure to include them next year. Hint: If you want to show up on lists like this it helps to have “SEO” in your Twitter bio. I only included people, not agencies, and I only included people who were easy to identify as people. That means those using some sort of nickname on their Twitter profiles that prevented me from knowing who they were didn’t get included. Sure, I could have researched who “Asad SEO” was but I wanted to promote those who are more up front about who they are. In building my list, I only included those who had tweeted within the past 90 days. Follower stats as of 2 May, 2017. Number 6, Nancy Badillo, and number 9, Steve Cartwright, are new to list. Rand Fishkin jumped 75,843 followers since last year ranking him 4th instead of 5th. You needed to have at least 14,220 to make the top 100. That number is considerably lower than last year’s 25,760. This was due to the lack of tweeting. Remember, I only included those who had tweeted within the past 90 days. 3 of the top 100 mention Star Wars in their bios! If you notice anything else interesting, comment below. 5 Scott Levy FuelOnline CEO of Fuel Online Premier Digital Agency SocialMedia & SEO Best Selling Author, Actor, Investor Huge NFL FAN! 14 Alexander Aranda ThinkBusiness Entrepreneur, investor, seo consultant, globetrotter. Stop reading this in your head and say HELLO! 39 Cyrus Shepard CyrusShepard Follow to learn about SEO, higher rankings, increased conversions, and 10x content. Founder of Fazillion Media. 75 Angie Schottmuller aschottmuller Growth Marketing Advisor & Keynote Speaker. Forbes & Entrepreneur Top-Rated Online Marketer. #StarWars Rebel. 91 Glenn Gabe glenngabe Digital Marketing Consultant at G-Squared Interactive, focused heavily on SEO, SEM, and Social Advertising.